You need poise and finesse to play elegant hocking in the middle of the pitch, and the Ritual Finesse hockey sticks in 2018 can assist with this, and some. A brilliantly balanced model from the Ritual hockey stick range in 2018, the Finesse feels right, handles brilliantly and looks a million dollars. With a slightly more subtle bow than other Ritual hockey stick models, and in a slightly different position that most of its competitors, the Ritual Finesse hockey stick is best described as a mid-low bow hockey stick. Most other brands have a bow position at 250mm up from the face, the Ritual Finesse is at 260mm. 1cm isn’t really a lot to write home about but for players who enjoy a higher bow position and need the benefits of a low bow, the Finesse is a good option. This 2018 model of the Ritual Finesse hockey stick also has a slightly less deep bow, 23mm instead of the common 24-25mm bows of other brands. Again, this only makes a slight difference but combined with the position it definitely makes the stick feel straighter than big low bow alternatives. What is absolutely evident from the Finesse (and all Ritual sticks actually) is the balance of the hockey stick is phenomenal. Quickly moving the ball in a dribble to swinging and hitting just feels so right with the Ritual Finesse. For me the moving, swinging and slap hitting was particularly great using the flatter lower part of the stick to keep the ball true. Which Ritual carbon model is right? 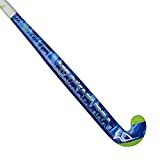 The Ritual Finesse hockey stick, like all other senior Ritual hockey sticks you can buy, is available in three different material compositions. There is a 95% carbon content, 75% carbon content and 55% carbon content model available of the Ritual Finesse sticks. Each model has 5% Kevlar aramid reinforcing the main impact areas (head and reverse edge) and finished off with a good quality fibreglass. Choosing which material configuration will come down to your personal preference and budget. The more carbon, the more power but at the detriment of soft feel on the ball. From my own experience of Ritual sticks, the balance point and quality of materials would make me lean towards a 75% carbon model, which hits as hard as some 95% carbon sticks from other brands. Ritual are one of those stylish upstart brands eating the big brands lunch by making really good quality, well designed hockey sticks. The Finesse model Ritual hockey sticks are all about the slightly higher, slightly straighter bow shapes. This is done really well in these Ritual Finesse sticks, not compromising the benefit of a shaft bow, but offering those players who aren’t totally comfortable with the big low bows of other sticks. I would buy the Ritual Finesse if I was a defender who often got forward as it offer a best of both worlds shape for slap hitting and dribbling. However you should buy the Ritual Finesse hockey stick if you feel the specification suits.